Aircraft avionics and interiors powerhouse Rockwell Collins’ orderbook for nose-to-tail inflight connectivity continues to grow, with the firm recently adding 100 new Boeing 737 MAX aircraft to its backlog for Inmarsat Global Xpress cabin connectivity and other services. With an eye to the future, the company has also unveiled a new phased array antenna to support the forthcoming OneWeb low earth orbit (LEO) constellation’s aero service, as well as other networks. It believes the technology – informed by its prior military and government work – will prove disruptive to the industry. But Rockwell Collins has largely stayed out of public spats in the connectivity space. Senior director, global marketing Richard Nordstrom readily admits that Rockwell Collins is operating in “stealth mode” for its airline partners on that front. “I think basically because, first off there is a lot of noise in the industry and you find when you join the cacophony of the noise you end up just being part of the noise and so it is better off to take who we are, our 87 years, [our] extensive existing relationships with the airlines that are very deep – we have a broad depth of knowledge within each of the airlines where we have business with them already – [and to] really try to work in that fashion rather than try to be part of the noise because it really comes down to, you just end up yelling louder and louder,” he told Runway Girl Network last week at the APEX EXPO in Long Beach. Rockwell Collins’ new MAX nose-to-tail connectivity customer is a “large Asia Pacific-based airline” which has opted for its CabinConnect wireless inflight entertainment and connectivity solution (the connectivity portion is supported by Inmarsat Global Xpress service). Included in the deal is Rockwell Collins’ ARINC GLOBALink services – including a “unique” multimedia ACARS communications package with VHF, HF, and SwiftBroadband-Safety Services (SB-S) – for secure voice and data communications in the cockpit. The undisclosed airline will also be able to monitor its aircraft fleet anywhere in the world using the Rockwell Collins’ MultiLink flight tracking solution. Some of Rockwell Collins’ competitors in the avionics space, including Thales, are eager to exploit broadband cabin connectivity on next generation flight decks. Is Rockwell Collins doing the same? “Well if you are going to do that, the moment that you have any of what we call ‘common usage’ of the big pipe in the back [used in] the flight deck, you have to think about security. And that’s number one,” said Nordstrom. Indeed, he believes safety services – as supported by Inmarsat and Iridium – will remain segregated on L-band “for the next five to ten years” at least. Thereafter, is it conceivable that the likes of Inmarsat Global Xpress connectivity might ultimately be deemed acceptable for safety? “Well if you had asked me this question five years ago we’d be talking about SwiftBroadband, and the I-4 constellation. And we would say ‘we don’t know’. We don’t know because the constellation itself hasn’t proven yet to be at the reliability and availability level and the quality level they need to do safety. So let’s see what happens. But you know they [Inmarsat] did it right with SwiftBroadband. I can’t see why eventually that might not happen on GX,” said Nordstrom. Inmarsat’s Mary McMillan made the same argument a few weeks ago to RGN. “She knows, she flies those aircraft,” noted Nordstrom. As has been well reported, Inmarsat increasingly wants prime position with airlines; it is even growing its portfolio of STCs as it forges those more direct relationships. The move begs the question of whether or not Rockwell Collins – and indeed other Global Xpress integrators and value added resellers – will alter their approach to the market. I think right now Inmarsat is going through a reorg, at least at the higher levels, and we are going to have to see how that plays out to see if there is going to be a change in direction, to see if they are going to reassess how they are going to market. That’s all right now up for discussion, I think. And I think we just need to sit back and wait and see what their decisions are. What I can tell you is we communicate, if not hourly, at least every other hour with them. We have a lot of communications and quality feedback, back and forth between Inmarsat and us. 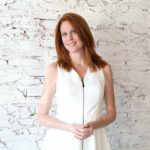 And you have to do that because they are an important partner to us, as a source for a network, but also we’re important to them because we bring other insights and other objectives that they just still don’t have yet. Though its cabin connectivity offering is supported by Inmarsat Global Xpress, Rockwell Collins keeps a close eye on its options in the market. “I think it is ingenuous if I said we don’t always reevaluate,” said Nordstrom. OneWeb is among those options. 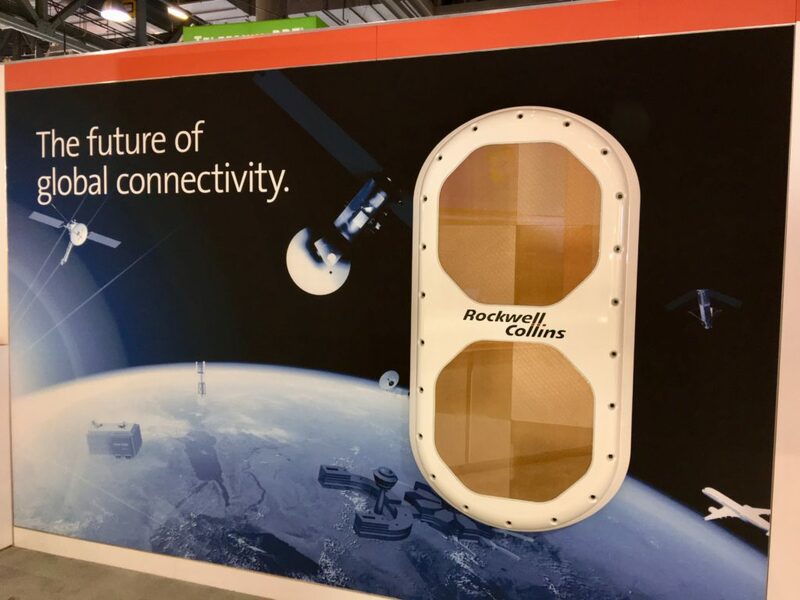 On the antenna hardware front, Rockwell Collins has made strong headway in developing an electronically steerable array antenna, with no moving parts, to support OneWeb, but also GEO and MEO satellites if necessary (which is very much in sync with Intelsat’s expectations for a shared GEO/LEO network with OneWeb). The antenna system was designed and developed completely in-house at Rockwell Collins. “We even designed the chips; we do it all and we can manufacture it also,” noted Nordstrom. The firm boasts “about 26 patents plus dual beam patents so we’re very strong on the patent IP side of this. This is why we have been kind of quiet about it. Because we have been strengthening all this so that when we do go to market with it, it will have a very strong presence. This is disruptive technology for the industry,” he said. Before Rockwell Collins signed an MOU with OneWeb to develop antenna technology, the manufacturer was “already doing that technology on a small scale for military and government, and the key was to take this technology and take it from a very expensive one- or two- or three-off and really bring it to a commercial financial state and that is what we have been able to achieve through all of our research. Especially, it’s the chips. The chips are the drivers in the price. They are very expensive typically, not just to create but to manufacture,” said the Rockwell Collins executive. While the antenna will talk to OneWeb, it can also talk to GEO orbit as well “at the same time”, noted Nordstrom. “And you can run television over this if you like…”. In terms of limitations, “when you are talking GEO, every antenna has a limitation when you approach 70 degrees North Latitude … so every antenna has that challenge. This antenna is no different when it’s talking to a GEO` network,” he said. “However we are able to raise some of our parameters on this to get us about another 4-5 degrees above that. More importantly, the initial design for this is around the LEO. Crucially, stressed Nordstrom, the antenna has been totally designed and built around aviation. “No others really have been designed to operate in an aviation environment,” he said in reference to other aero antenna systems on offer. There have been mixed reports about the current flat panel antennas on the market. Rockwell Collins believes its system is far superior. The bottom line is that what you are seeing here has already gone through DO-160. We will be looking at 50,000hr MBTF [mean time between failures] on this. There is not an antenna on the market today that even comes close to that. This has already gone through [being] totally designed and built around aviation. None of those others really have been actually designed to operate in an aviation environment. Providing further colour about the antenna, Rockwell Collins pr electrical engineer Lee Paulsen – who has played a pivotal role on the program – told RGN: “So what we are looking at is a phased array antenna that is similar in outside appearance as some of the other technologies that are out there but it does its beamforming in a very different way than say, Phasor or Kymeta, as far as I know. I don’t have any direct knowledge of what those guys are doing; they make a lot of white papers and things like that but it’s hard to really say without having a sort of NDA in place, which we don’t have with those folks.